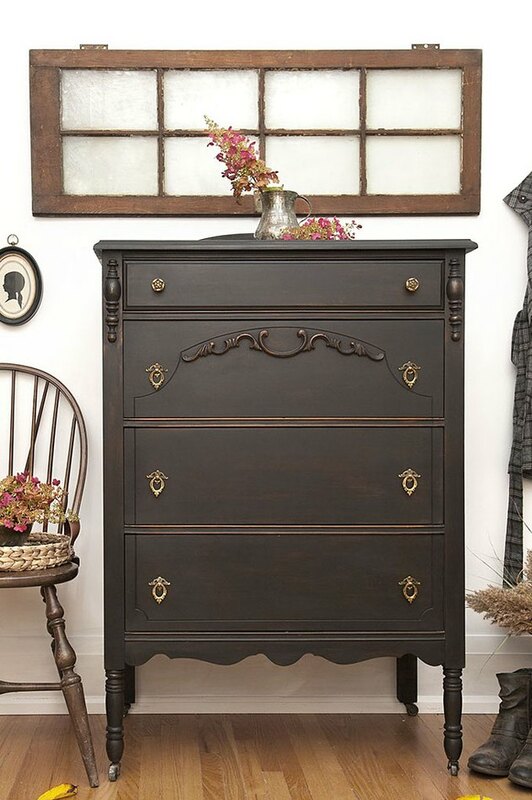 A vintage dresser is more than just another place for storage. There is something undeniably special about a piece of furniture with its very own history. Every tiny scratch, little ding, and small imperfection tells the story of a rich life lived, making it truly one-of-a-kind. The aged and weathered appearance typical of a vintage piece exudes a certain je ne sais quoi that a modern piece of furniture just can't provide. Ideal for displaying photos, treasures from your travels, books, knick knacks, and more, this classic's serviceability isn't just limited to the bedroom. 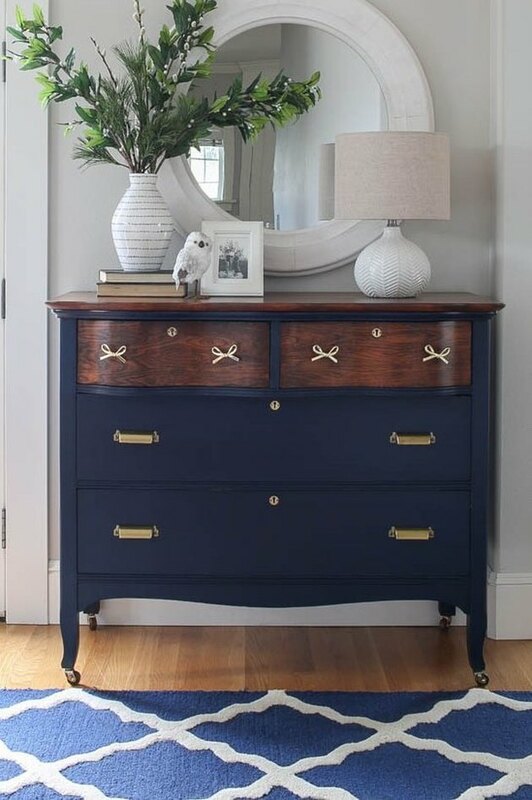 Simply put: The possibilities are endless when it comes to styling and utilizing a vintage dresser. Need some inspo? 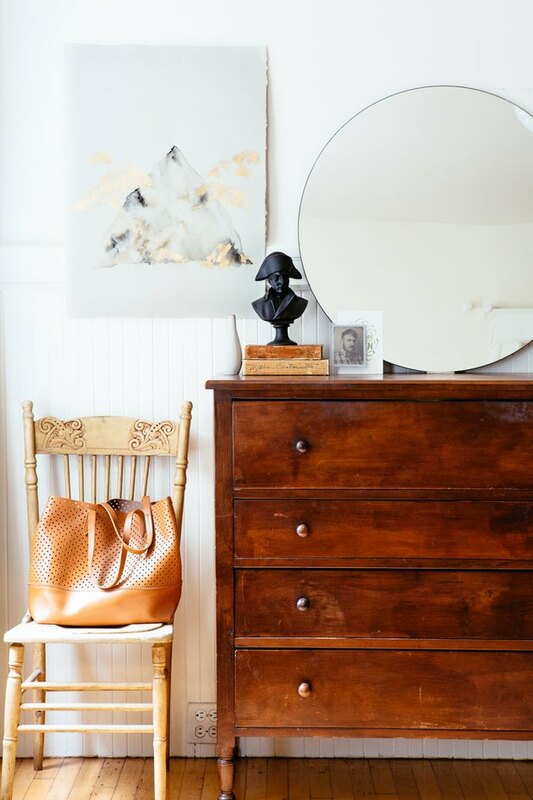 Scroll on for 10 useful tips and ideas for putting together the timeless dresser of your dreams. 1. Channel your feminine side. This vintage beauty hits all the right notes. It's sophisticated and refined enough for a posh, Parisian flat, while soft shades and personal flourishes infuse charm and personality. 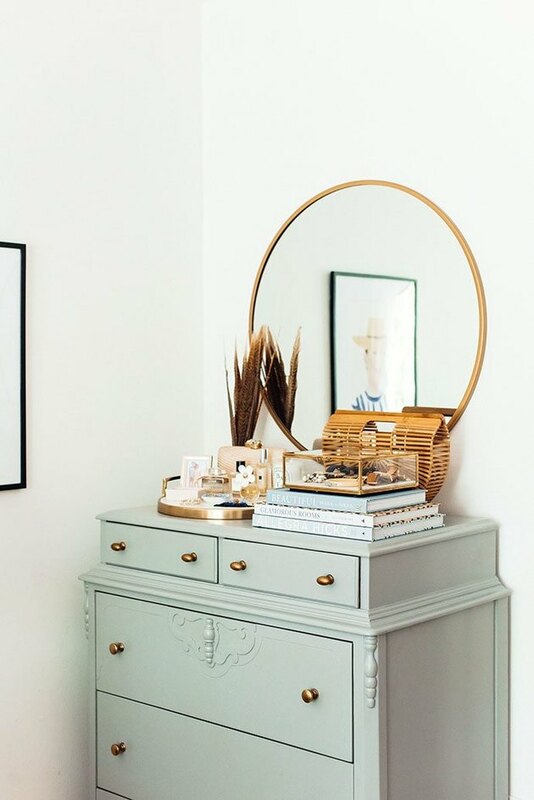 A couple coats of pale teal paint and two different brass drawer pulls, up the femininity of this sweet little dresser. 2. Turn it into a desk. Talk about doing double duty. 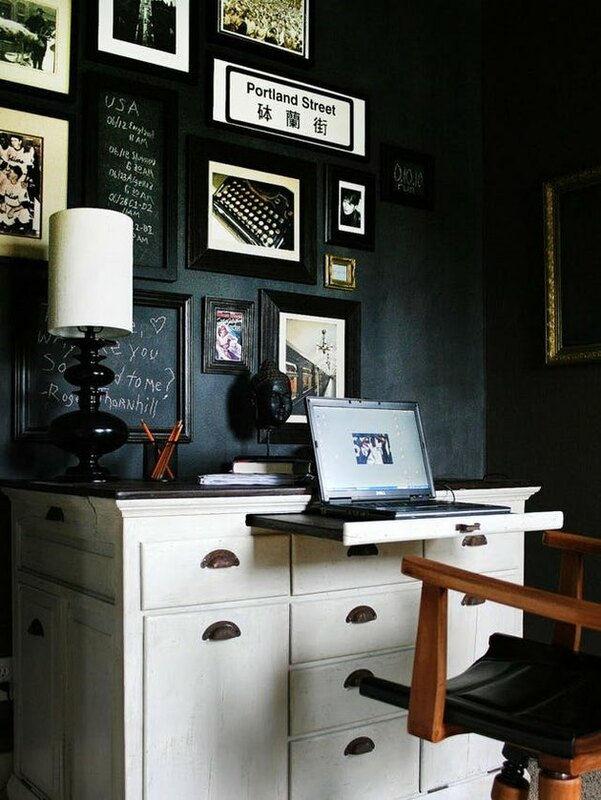 This classic dresser turned compact work space is a prime example of upcycling. And we love the way the white finish pops against the black walls. 3. Pair it with graphic wallpaper. 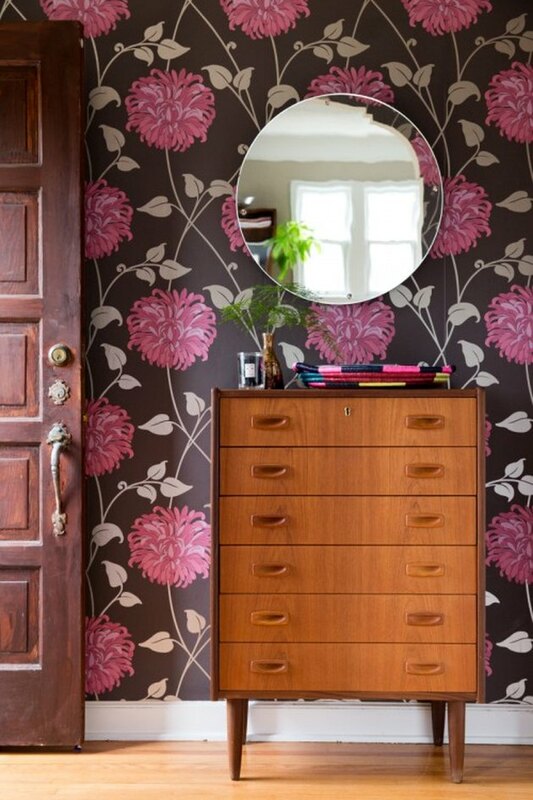 Graphic floral wallpaper reinvigorates the entryway of this Minneapolis home. 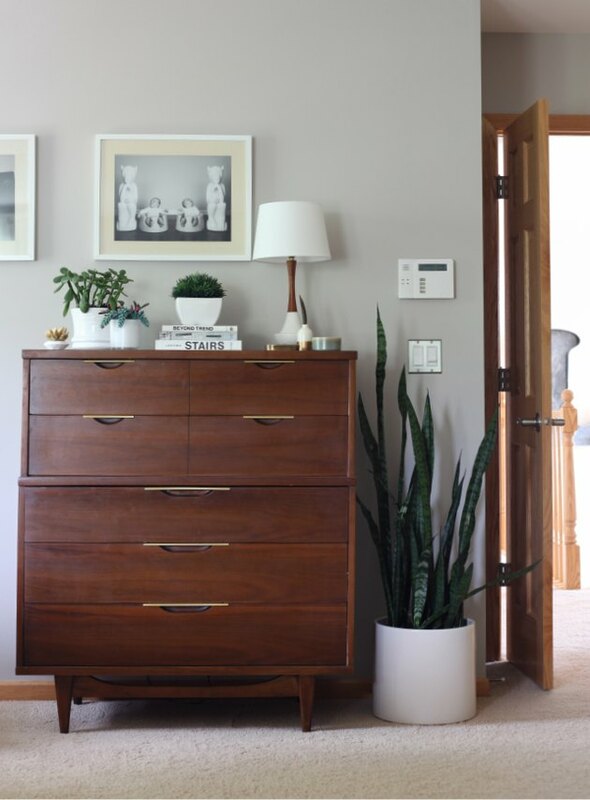 The narrow profile of this midcentury dresser fits perfectly in this petite space. A frameless mirror lends depth and dimension. Midcentury meets minimalism. The wood dresser says 1960s but the curated selection of crisp white accoutrements — texts, potted plants, and a table lamp — are decidedly modern. 5. Update it with a fresh coat of paint. Proof that color can totally change the entire vibe. 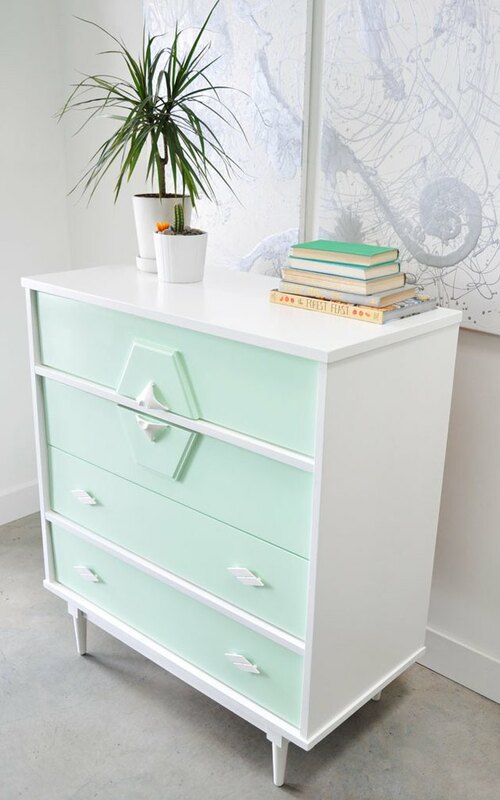 Nicole from the blog Visual Heart updated this vintage treasure with a fresh coat of high-gloss lacquer. An artful stack of tomes (in coordinating hues) and potted plants round out the look. 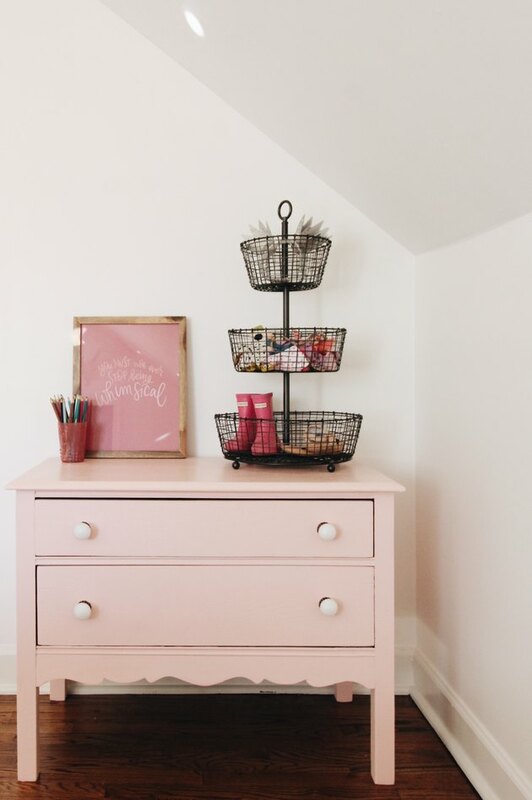 How cute is this tiny pink dresser? 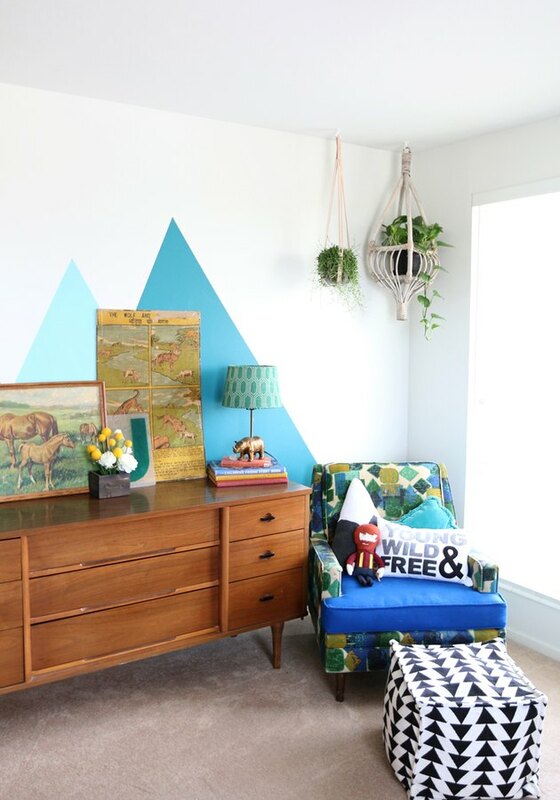 Originally discovered at a flea market, Jessica from the blog Garvin and Co. transformed this vintage find into the dresser of her little girl's dreams. With a few coats of pale pink paint, some new knobs, and some wallpaper to line the drawers, this mini chest was better than new. 7. Transform it into a bathroom vanity. Think outside the bedroom! 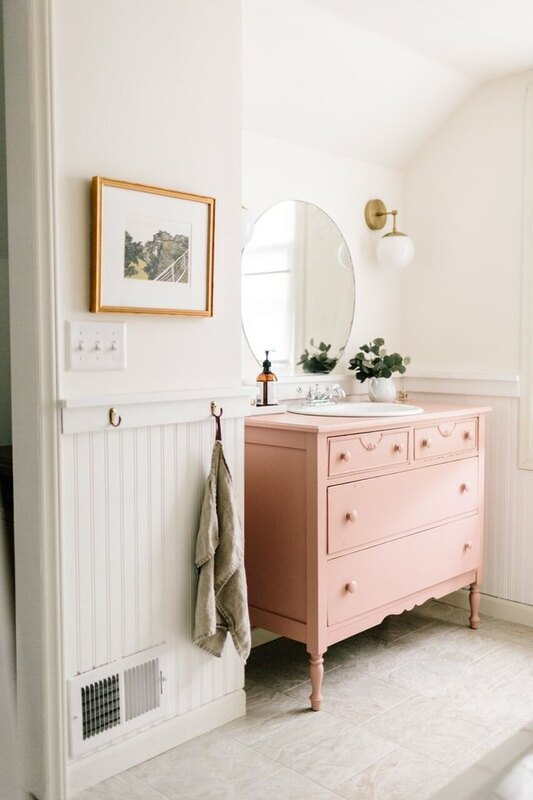 Wit & Delight transformed this antique dresser into a bathroom vanity by painting it pastel pink and installing a sink. Rachael Skidmore's Salt Lake City dwelling is filled with vintage charm. And her son's bedroom is no exception. A midcentury dresser — purchased at an estate sale — is paired with retro-inspired prints and cheerful accents. 9. Have fun with hardware. This thrift store steal had adorable bones but was in poor condition, so Susan (the DIYer behind the blog Saw Nail & Paint) totally revamped it and introduced new brass bow pulls from Land of Nod. A round mirror and matching white accessories complete the playfully coastal vibe. 10. Allow original details to shine. When the original details are this darling, you don't need to do much. The blogger Denise from Salvaged Inspiration refurbished this piece with a little matte black paint and added a simple vase with seasonal blooms. What's great is that you can switch up the arrangement for spring, summer, fall, and winter.